At the heart of Smart Infrastructures™ is Omnitrol's industry acclaimed IoT application platfrom. Our platform was built to scale but with a focus to simplify integration of IoT smart devices with enterprise applications to deliver real-time operational intelligence solutions. As such, our platform is known as "EASE", or Enterprise Application and Sensor Engine. EASE encapsulates the complexities of IoT device management and complex event processing with business applications, providing a highly versatile IoT event-driven operating system for application developers. Application development and delivery is further simplified by our integrated IoT device emulator, called EdgeView™. Applications can be developed, tested and deployed using the devices provided on the EdgeView™ IoT device emulator. Complete development of IoT micro-services, we call Edgelets™, including testing and work flow analytics expected with actual sensor devices (e.g. RFID, SCADA, PLC, A/D controllers, etc.) can be completed for deployment readiness using EdgeView™. 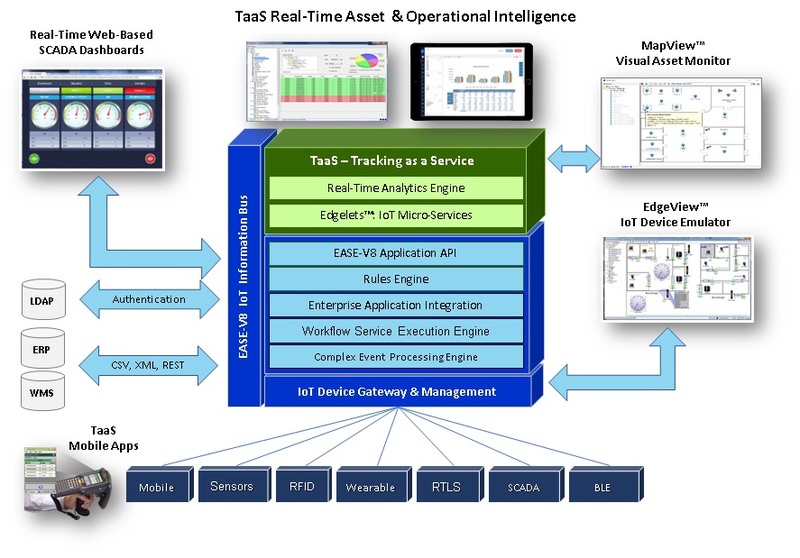 EAI for real-time operational intelligence with ERP, WMS, AMS, etc. Plug-n-Play adapters for SCADA, RFID, RTLS, BLE, Sensors, Serial, PLC/Modbus, etc. The Omnitrol EASE-V8™ IoT application platform is a fully integrated Smart Infrastructures™ solution framework. Our vision to simplify IoT business and operational intelligence was developed in close collaboration with our customers' production environments. As such, our EASE-V8™ platform is a tried and tested, vertically independent software architecture that can be applied in any industrial or consumer application, in the cloud, on premise, or as a hybrid cloud-to-edge (premise) solution.